This was a fun and challenging project! 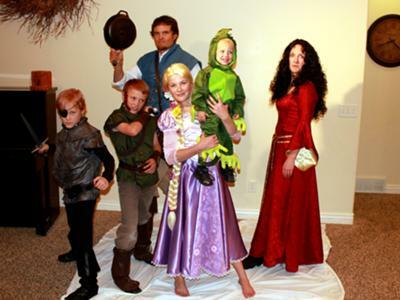 My daughter is Rapunzel, my husband is the infamous Flynn Rider, and I am the evil Mother Gothel. Our two oldest sons are the thugs, the Stabberton Brothers. 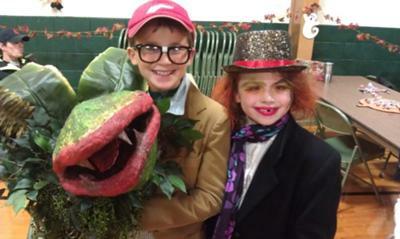 My youngest is the chameleon, Pascal. 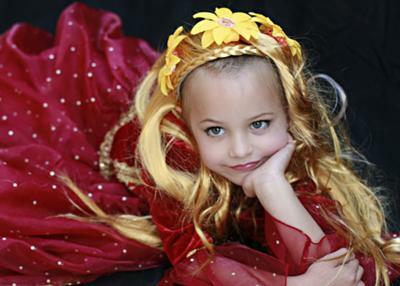 The hardest and most time consuming costume to create was Rapunzel's dress, I used at least three different patterns. Flynn Rider's vest was a close second with all of the detail. All the costumes are handmade using various fabrics and patterns. 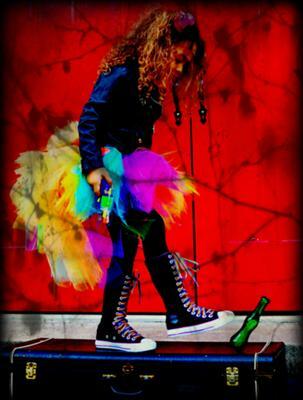 The dresses are made from satin and organza, the vests and boot covers are made from fake leather and denim. Pascal was made from velvet and fleece. The wigs and sideburns were purchased from an online wig company. 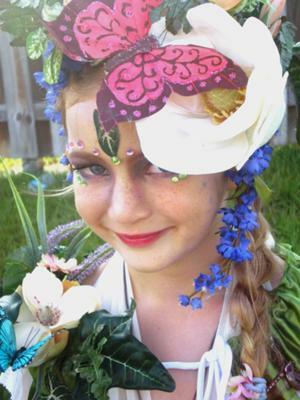 We braided Rapunzel's and adorned it with fake flowers. The belts and satchel were purchased at a thrift store. Sword and dagger were purchased online. 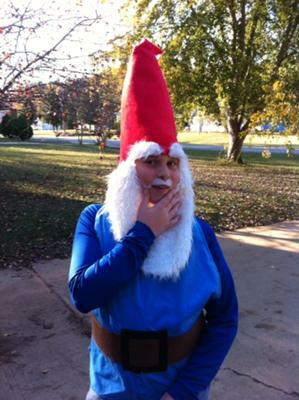 Our son's first Halloween as a garden gnome! 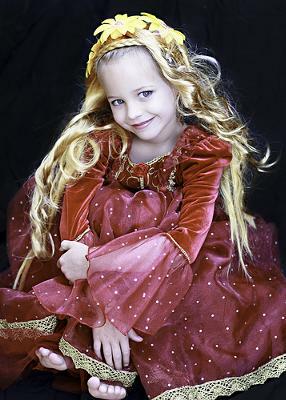 I made the Red Queen dress and then added the details using dollar jewelry. Her scepter was my sister in law's wand from prom. I added a red heart in the center. Her crown was made from poster board and then spray painted gold. I left it on top of the car's dashboard pressed against the window so the top could curve. Then added chains from fake jewelry and red jewels. Her hair I parted in two pony tails. I teased it and fixed it to form two balls. Then I spray painted red and placed the crown in the center using bobby pins. Her makeup was lightest foundation and powder. I covered her whole face including her eyebrows which I then painted a bit higher. She had blue eyeshadow and formed a heart on her lips. Also made her a mole by cheek. 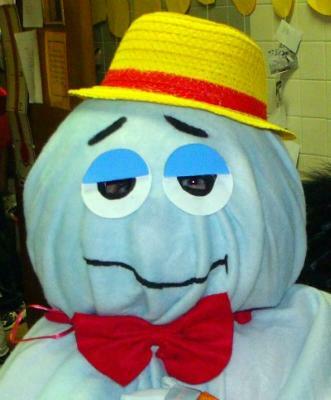 The Mad Hatter hat was also made from poster board. I found a dress at the thrift store which I used to cover the hat. Then added the different color patch from another cloth. I used the wire from a witch's hat to make the rim from hat and sewed it. I added the peacock feather and needles inside the ribbon. The ribbon I made from a cloth as a scarf and then tied it around hat. The 10/6 card I made from poster board and burned from the edges. His coat was bought at a thrift store and I added the lace and buttons. I also added two buttons on the outside to hand the thread belt. The vest,pants,pink shirt,shoes and socks were also bought at a thrift. The pants were made pin striped by gluing tape and using cloth spray to pain them purple. I bought them a smaller size so they could be capri and made them a bit bell bottom. His gloves were made by outlining his hand on a cloth and then just sewed them. His belt was made by threading the spools and tying at the end. Then made a loop to hang from button previously sewed. His bow was made from cardboard and covered with cloth. I bought different colored ribbons and used a safety pin to put them from coat. He also had different thimbles on and I made him a ring cushion. The pocket watch was bought as well as his eyebrows. For the hair I bought scrunchies that are made from hair at dollar store. I cut them open, teased the hair, and spray painted them orange. I placed them on his hair with bobby pins. 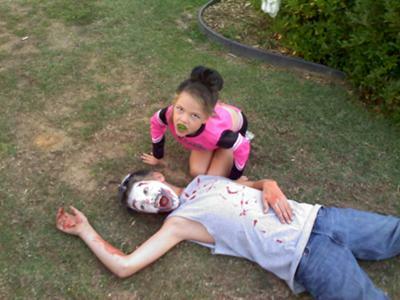 His face was painted using the same foundation and powder as Star and then made one eye pink and one purple. Also put pink under both eyes and pink lipstick. 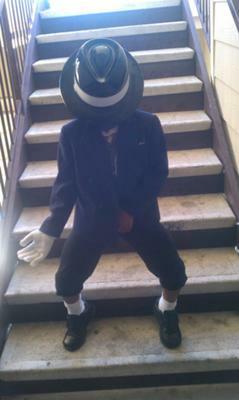 5yr old Makhi starring as Michael Jackson "Billy Jean"
My 1 year old son is obsessed with elmo! 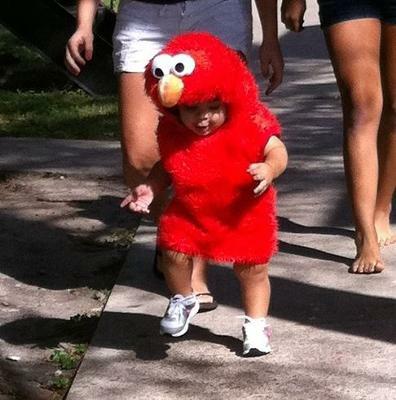 He constantly carried his little elmo doll around. 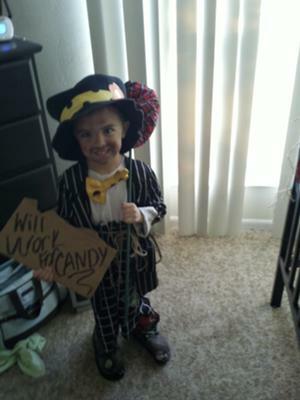 So, I knew he would love this costume and as you can tell by the picture HE DID!! 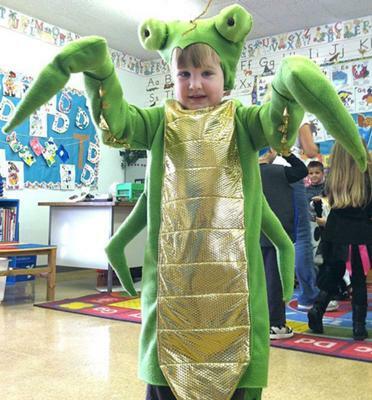 Zachary suffers from sensory disorder so wearing costumes is very hard for him. He wanted to be Chucky so bad but wanted to do something no one else has done. 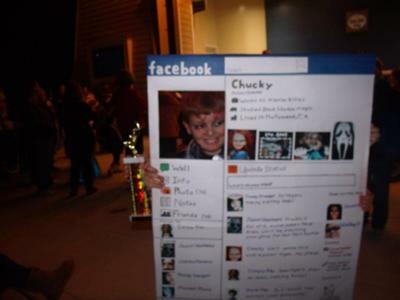 He wanted to create Chucky's facebook page. We created the page based on if Chucky were to have his own page. He has his friends Jason and Freddie and even included some evil people he may know. We even had his wife and child involved. This picture is Zachary winning a trophy for a local parade where he won 1st place. It was the highlight of his year. 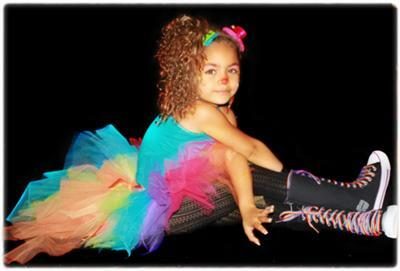 This is a photo of my daughter Jalyssa Skye. 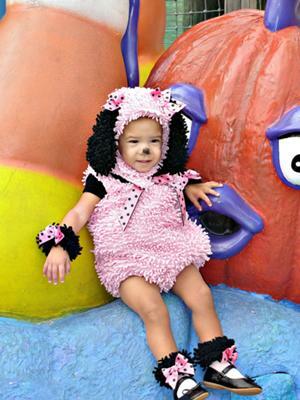 She is a Pink Poodle for Halloween. I brought her to the Halloween Spooktacular and stuck her on this structure and snapped a Picture. She is the cutest poodle that I have ever seen and I hope that you've ever seen also. Riley is 6 years old and is in the first grade. 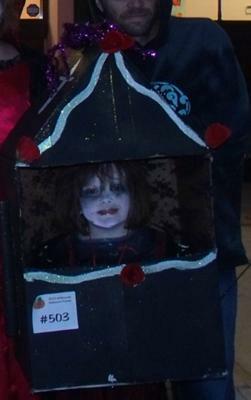 She wanted to be a scary vampire this year so we took it a step further and made her a walking coffin. She looked so great and she loved it but the Thursday before Halloween she fractured her wrist and the coffin was hard for her to hold up so with a few adjustments we made it work. You will see a number on her coffin because she was in a parade and actually won second place. She was so thrilled especially since she had to walk in the parade with the broken arm. 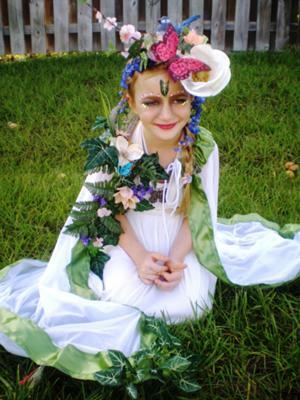 My daughter requested a "Mother Nature" costume for Halloween this year. I went to work brainstorming how to execute something magical and fantastical. I wanted it to really capture the presence of beauty and the spirit of nature. I made my first shopping trip to the thrift store. I purchased some adult nightgowns (which were cut and sewn, and bordered with ribbon) to make the base of the cloak. I also purchased a used prom/evening gown. This was an adult size so it required so tailoring to fit. Next I headed to the local craft store. Here I purchased many embellishments. I got some butterflies in different sizes and colors. Some of the more authentic looking flowers and vines. I got a bird and a nest. (She insisted she must have a bird) I also purchased little jewels from the scrap-booking section to add some color and dazzle to her face and make-up. After cutting apart, placing, arranging, stitching on, hot gluing some, and bending and twisting, I created the head piece and then adorned her cloak. In the end I did her make-up to look extra magical. Using false eyelash glue I fixed one fake leaf to her forehead, and outlined her eyes with the scrap-book jewels. In the end, we were both very happy with all the hard work. The costume took me about 12-15 hours of construction (after collecting all materials) which probably would have been a little shorter had I had more experience with the sewing machine. To get a nice scenic photo worthy of Mother Nature herself, I simply sought out a green path of grass and sat her down, draping her cloak around her. 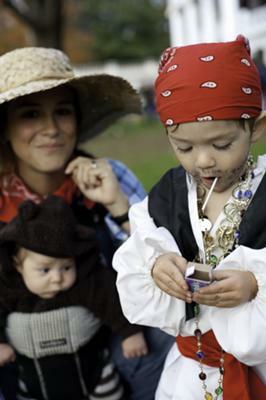 This is me with my husband and our twins on Halloween at a fall carnival. 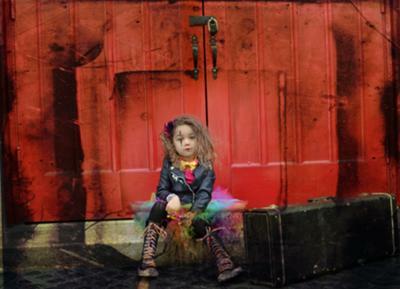 photo by me, rosemary.. my daughters name is lea this photo was taken in front of a red door of a church. I didn't want her to look like the traditional clown sad and gloomy clown was what I aimed for when taking these photos. 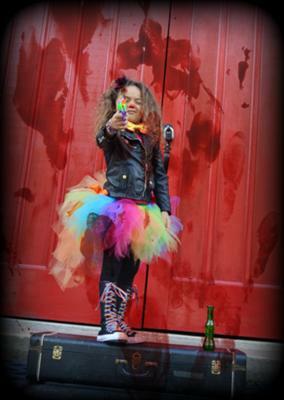 My six year old daughter has gone beyond Princess status to demand that she be the Queen for Halloween. A bored queen, perhaps but a Queen none the less. Picture taken by mom using just a black sheet in the background. 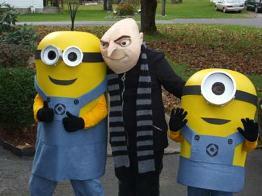 This is a picture of my 10, 8, and 5 year old boys as Gru and his minions. The minions were completely homemade. They had a blast and people went wild over them! 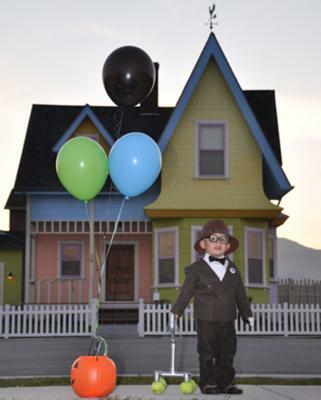 My 2 year old LOVES the movie UP and likes to pretend he walks with a cane. 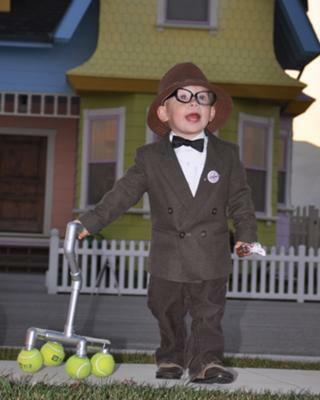 Here he is dressed up as the "UP GRANDPA." These photos are taken in front of a custom built home based on the UP house. The cane is also a custom build by Daddy :). 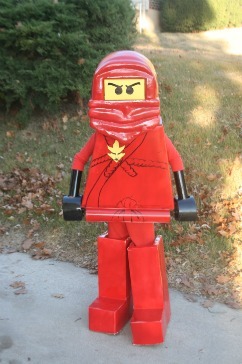 This is a hand made minifigure of my son's favorite Lego character. 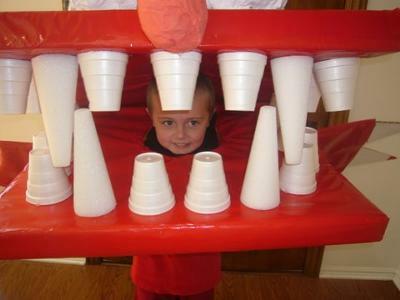 It is made mostly out of styrofoam. It took approx. 30 hours to make once I knew what I was doing. Cutting, sizing and carving the styrofoam took quite some time. After several trial and errors, I ended up stacking then gluing the pieces into a 2 foot block then began carving the head out. This took the most time and was the messiest part. The yellow part of the Lego head is made out of poster board and backed with a flexible screen (eyes) so he could see. The hands were also stacked pieces of styrofoam that I carved out. Because spray paint and styrofoam don't work well with each other, the pieces were covered with poster board (except the head and hands) attached with Craft Bond glossy side up then spray painted. The head and hands were covered with several coats of Acrylic Gesso (kind of like Elmer's glue) then spray painted. The glossy side of the poster board and the Gesso give it the plastic look when spray painted. 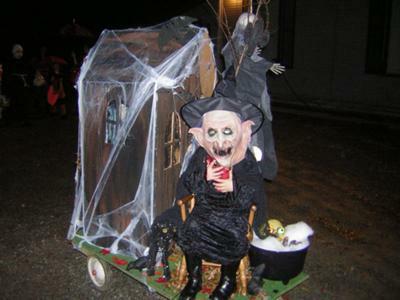 This was taken while trick or treating in Port Washington, WI. 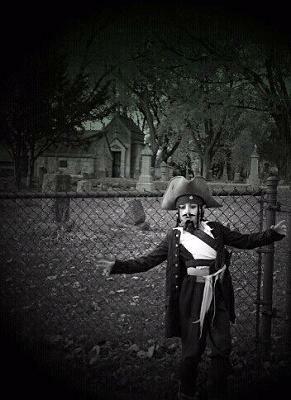 My son, a huge Jack Sparrow fan, walked - talked - & became Jack Sparrow for the night. 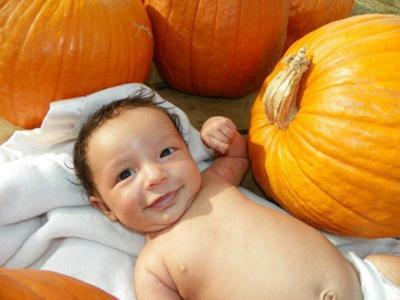 Raphael Antonio just loves halloween and you can tell by this picture and the smile he has! Our daughter is a gymnast and came home from the gym at the beginning of October with this idea. 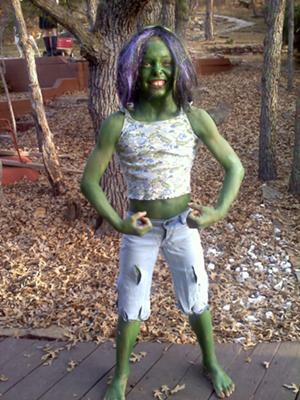 She was so excited to paint herself green, she could hardly wait!! She enjoyed this more than any princess dress that she dawned before this. 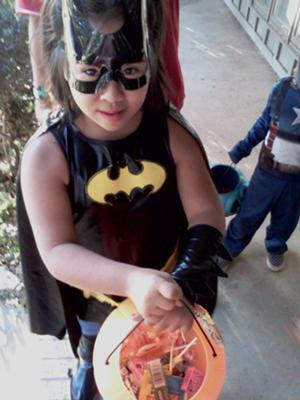 Emma Lizette choose batgirl as her costume, she is 10 years old with Downs Syndrome, very smart, vert funny, and cares about her family and friends. she loves to draw, read, and making people laugh. 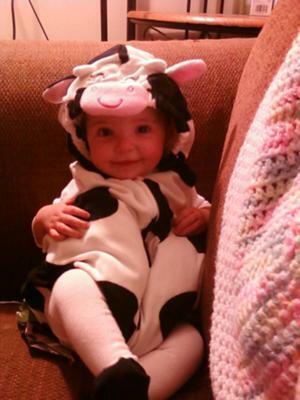 This is my first daughter's 1st Halloween. Instead of doing the typical princess, flower, butterfly, I went with the way too cute elephant. As soon as I saw the costume I fell in love with it. I got so many compliments on it as well. This will be a Halloween that is never forgotten! The bull was made from chicken wire and spray foam! Lots of spray foam and lots of hours! The horns are from a texas long horn. This is Jackson Smith. Jackson is 3 years old and when we went shopping for his costume, we could not find anything to fit him. Jacks is in between sizes. We told him that we would go somewhere else another day to see if we could find something that fit. He sadly sat down in the store and said that no costume would fit him so he guessed he would not be able to have Halloween this year. 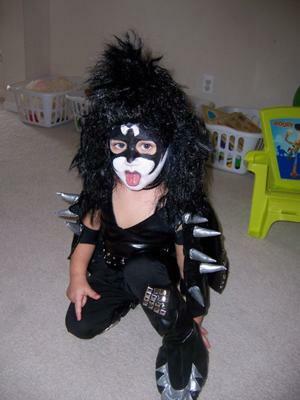 Well, this broke his daddy's heart, and he would not leave the store without something... 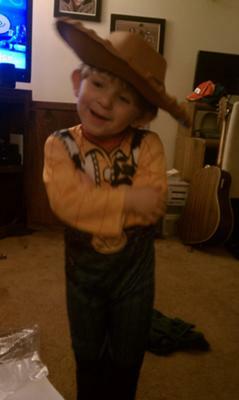 So, we ended up with this Woody costume that is too short for him. He loves it! He posed for the camera very easily as Woody. 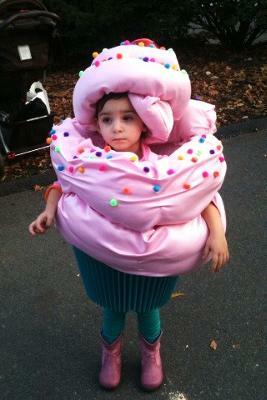 Two year old Carrington requested to be a pink cupcake this year, and that's exactly what her Nana made her! With an old upside down, spray painted lampshade, and some material stuffed with poly-fill, Carrington was topped off with pompoms and a large, red Christmas ornament as a cherry! 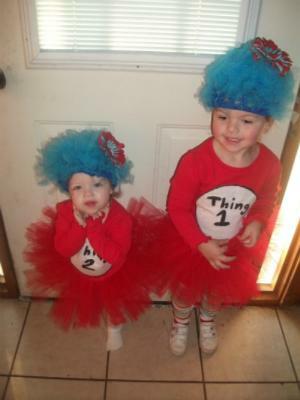 From about November 1st of last year, I knew I wanted my girls to be Thing 1 and Thing 2 from The Cat In The Hat. So I had plenty of time to think about how to make the costumes! Natalee wore her “hair” all night, although Juliette got tired of it at the end. 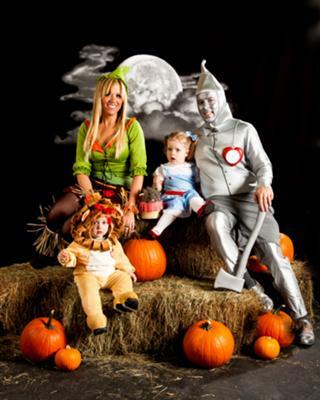 All in all, I think I will make their costumes every year!! 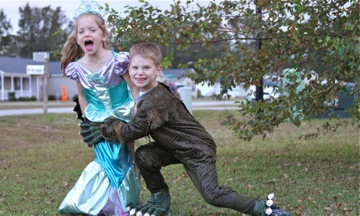 Swamp Monster caught the Mermaid! Swamp Monster catches a Mermaid! 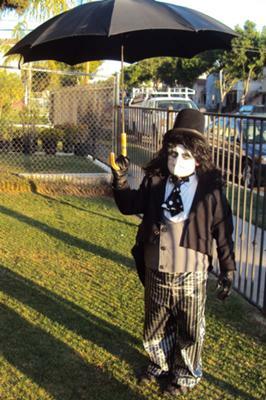 This is my 8 year old kid he is dressed as the penguin from the movie batman!!!! At the last minute my daughter made this cute little scarecrow. 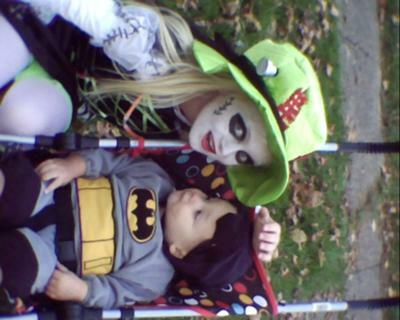 She couldn't figure out what she wanted dress my grandson Logan up as for Trick or Treat. 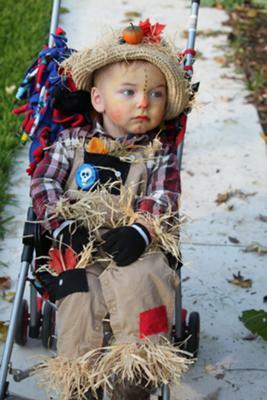 She called me and told me she was going to make him a scarecrow costume and boy did she ever. She did such a great job everyone we walked by was impressed. 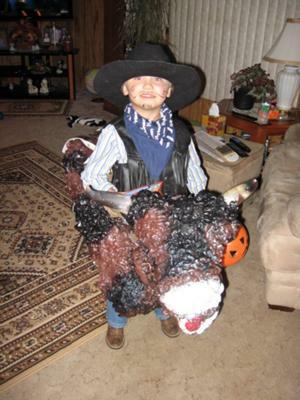 The costume even has a little crow sitting on his shoulder. She did an amazing job with this costume. 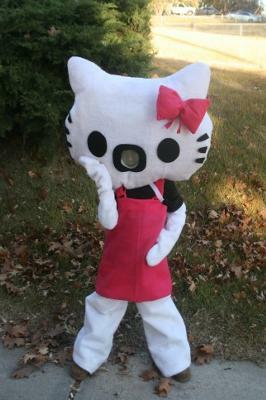 I made this Hello Kitty costume for my daughter. It is handmade, mostly out of felt. She was a hit. 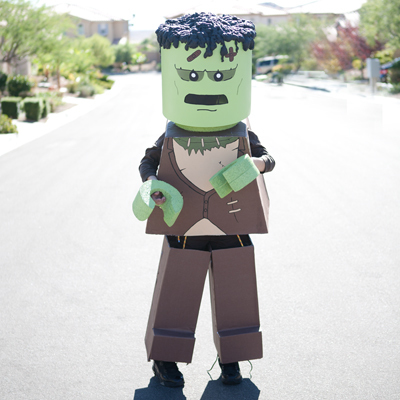 We love legos at our house, so when my son came up with the idea of making a lego frankenstein costume, we were excited! Made from carboard, foam and spray foam for the hair. It was fun to make, and so fun to see everyone's reactions. My son loved it! 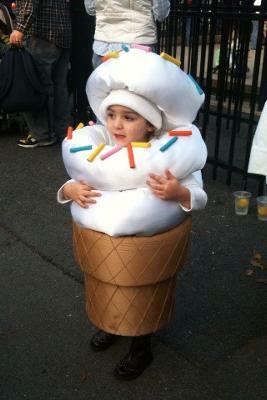 Zoey the Ice Cream Cone! Zoey wanted to be a vanilla ice cream cone ever since she had her first cone this summer! 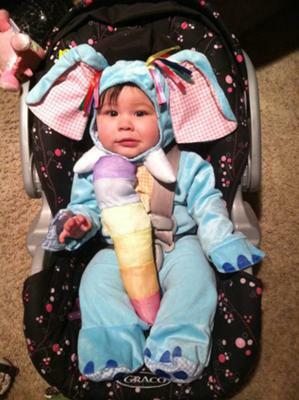 With a fabric covered upside down lampshade and a long stuffed piece of white satin fabric, Zoey's Nana created this ice cream cone costume, complete with painted dowel rod sprinkles! 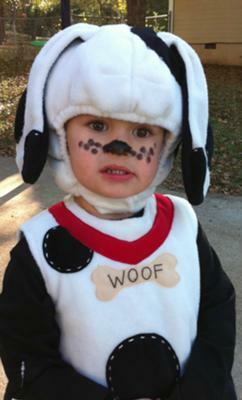 He loves animals and especially puppies so we couldn't pass on this adorable puppy costume! Love that sweet face..
Cutest hobo I've ever seen!!! 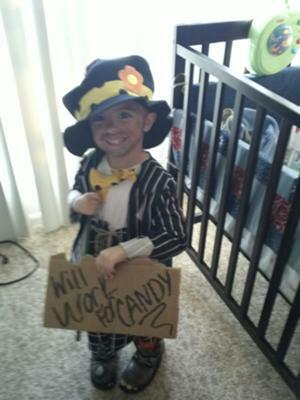 Jackson is 3 years old and he will work for candy if you have any little jobs you need taken care of he would be more than happy to help!!!!!! 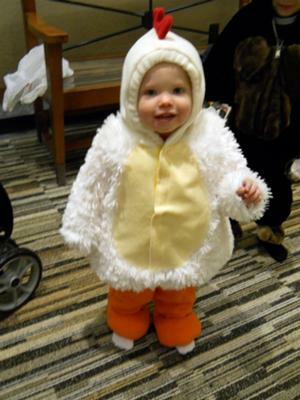 My daughter is 2 years old and picked the chicken costume for Halloween this year. Thus we present to you "Gracie as Chicken Little." Oh no!! !...Christopher's sister Mackenzie got him!!! My son Christopher who is on the ground is 14. The little girl is my daughter Mackenzie who is 6. She is a vampire cheerleader and has just gotten her big brother. Father and son looking at a lit pumpkin for the first time! 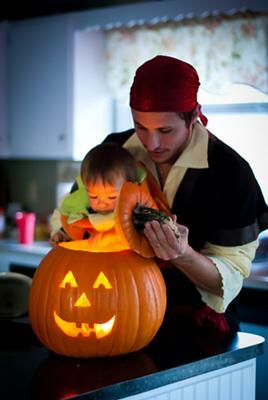 I took this photo after my husband and my son carved his first pumpkin. It was really cool how fascinated he was about the lit candle inside. 4 year old Sammy Davis Jr.
My 4 year old loves Sammy Davis Jr. He watches clips of him online and dances. This year for Halloween he went as Sammy. The winks and Sammy faces were all him. Emily is 3yrs old. 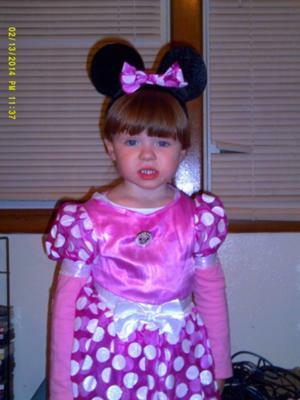 She is minnie mouse. 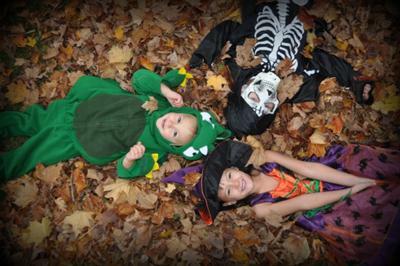 Halloween is the most wonderful time of the year for these siblings! 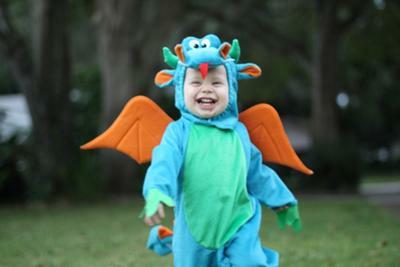 At 16 months old, our baby dragon has escaped from his cave and is loving it! 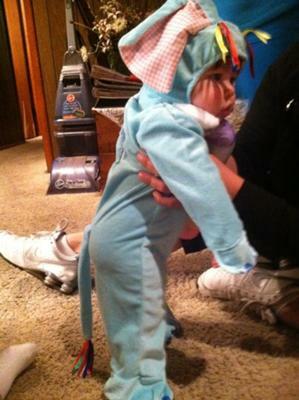 Mackenzie's First Halloween 4 months old!! 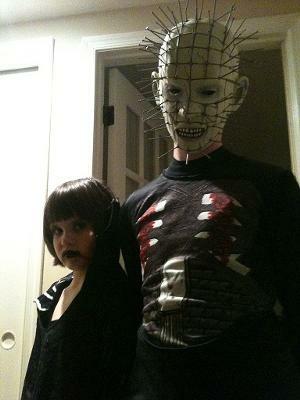 As a family tradition we always make our 8 year old daughter costume. This year we decided to make it a family affair. Since there are 3 of us a 3 very popular cereal monster we thought it would be perfect. 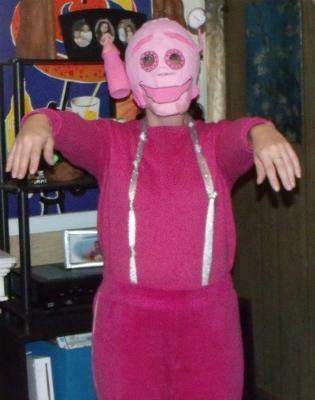 Our daughter was Boo Berry, her daddy was Count Chocula and I was Franken Berry. We used paper mache on all 3 and it was very easy. We have had a great time this year! 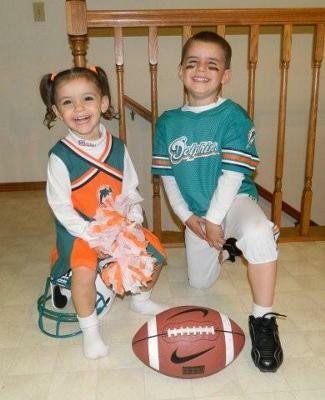 Madison (2.5 years old) and Michael (4.5 years old) dressed up as Miami Dolphins football player and cheerleader for Halloween 2011. 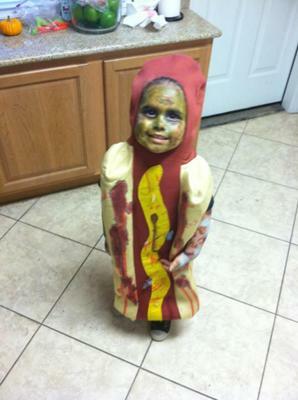 Brooke has been asking us to be a hotdog zombie since last halloween! What an imagination! My daughter Selah just turned 4 and is very interested in ant habitats. 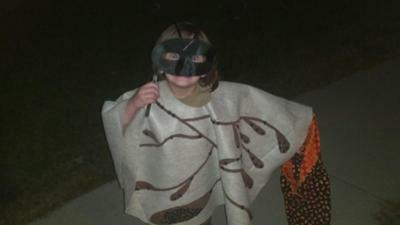 This year for Halloween, she decided she wanted to be an ant hill! 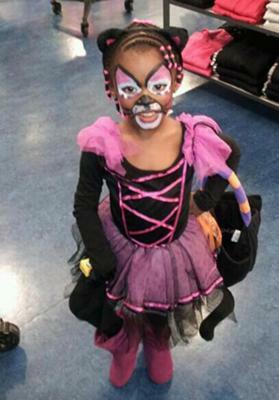 She designed the entire costume, including the "mask on a stick". Note the accuracy of the "winter room" where the ants can congregate in cold weather. 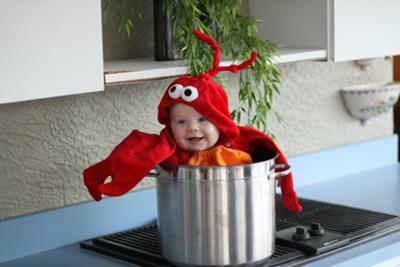 Our baby lobster was celebrating his first Halloween at four months old and just loved making our family laugh! 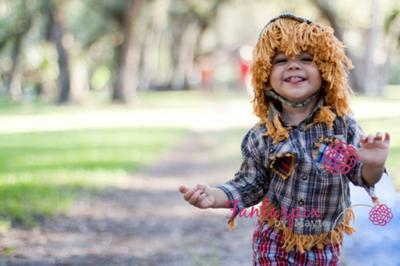 My little girl always gets comments that she looks like Shirley Temple, so I decided to dress her like her for Halloween. 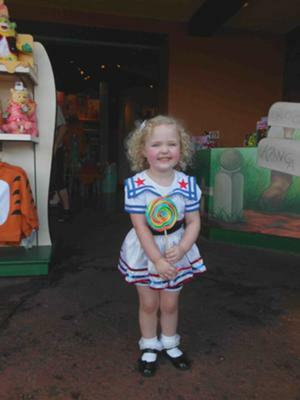 I took her to Magic Kingdom and got her a big Lollipop! She sure did get alot of fans! 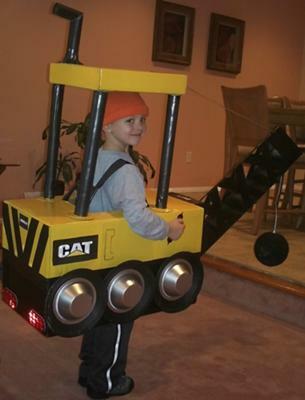 My three year old son is obsessed with backhoe loaders, or diggers, and that's all he wanted to be for Halloween. With the help of his Aunt, an art teacher, we used a diaper box for the body, another box cut in two for a front loader and back loader, lots of black duck tape and hot glue, two cardboard tubes from dry cleaning hangers, yellow spray paint and black Sharpees. For additional support for the back arm, I used a Swiffer duster handle stuck in to the back top of the box and duck taped to the top of the arm. This took many hours, a lot of materials and a lot of designing involved, but it paid off! 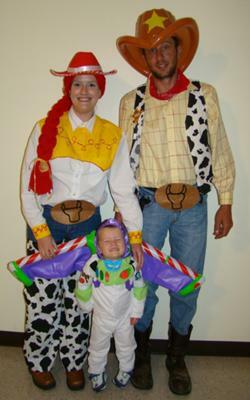 Our son Triston loves Toy Story and so I made (mostly) our costumes. 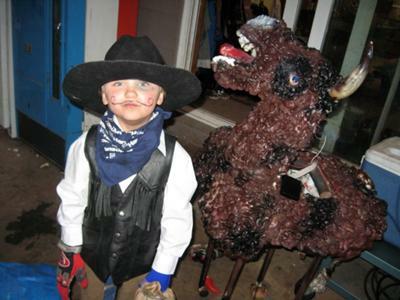 This is the first year that he understands what dressing up is all about so the whole family is joining in! 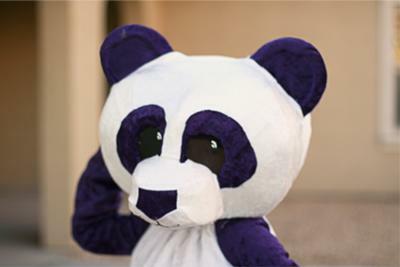 My daughter is obsessed with Pandas and the color purple so it makes perfect sense that she would want to be a purple panda! Every year I ask my children to choose anything they want to be and I love the challenges they present me with! 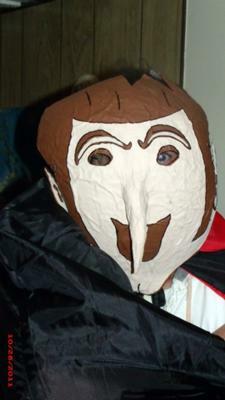 The head is made out or plastic canvas as a frame and then covered with foam and fabric. I made all pieces myself without a pattern (including the suit) and she helped me cutting the fabric. 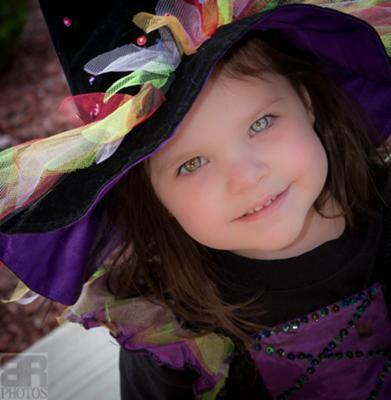 She recently ran a 2k in costume and is looking forward to trick-or-treating! 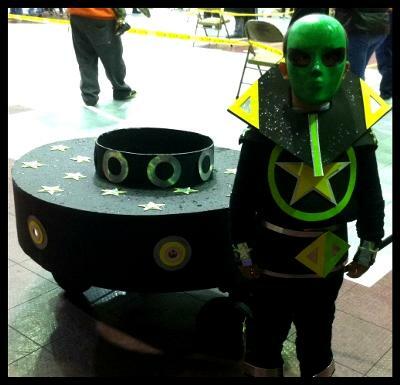 My son Jayden is dressed as an Alien and is standing in front of his ride-on UFO that lights up. 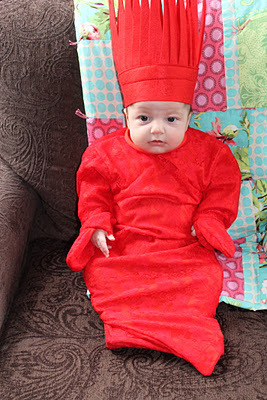 This is our daughter Linna Jane at 2 1/2 months old, dressed as Baby Gaga! 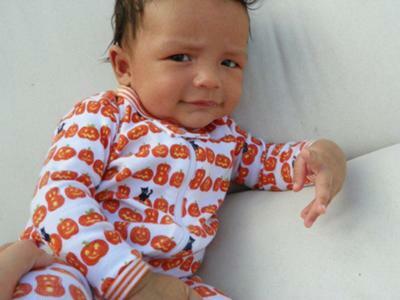 Andrae is 3 months old and this is his first Halloween. 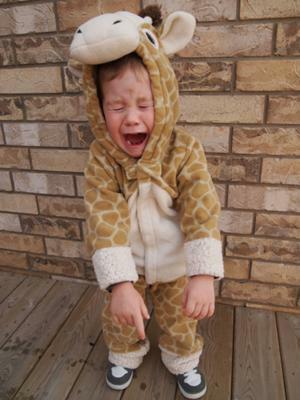 He got to go to boo at the zoo and the giraffes were his favorite. 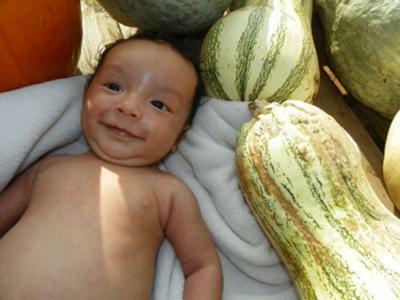 He's such a sweet happy baby and u can see that in this pic. A VERY FUN AND SPOOKY HALLOWEEN!!!!! MY DAUGHTER LOOKS SO CUTE!! She is the best kid a mom could have! 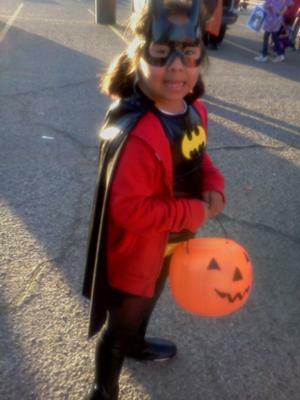 we went out trick-or treating she had so much fun. 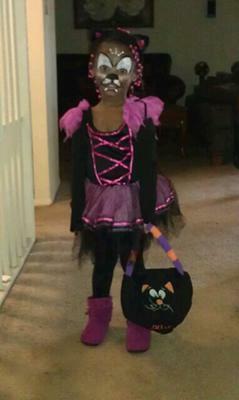 These pics are of her the night of Halloween! she got so many complments! so i thought id try this for her.thank u! This is my 8 and 4 year old kids. 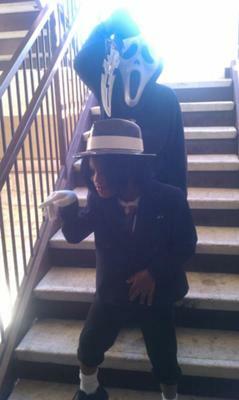 My 8 year old is dressed as the penguin from the movie of batman and my 4 year old is dressed as the mask Jim Carey!!! 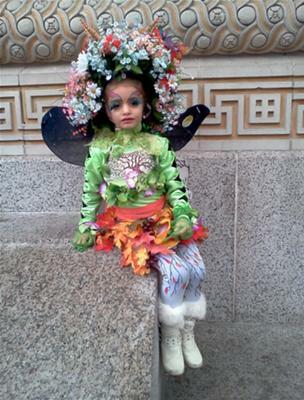 We put this costume together thinking my 6 year old daughter was going to be a butterfly. 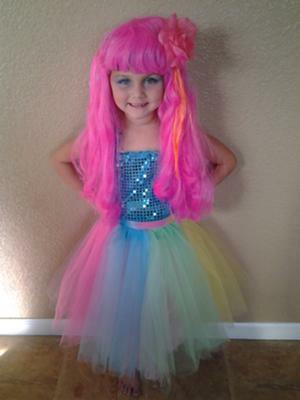 Turns out she thinks she looks more like Katy Perry! 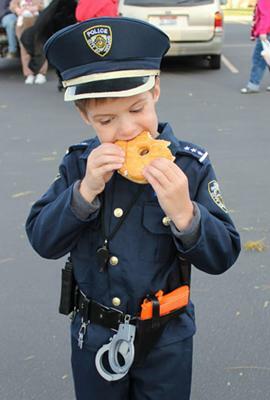 This was near the end of the trick-or-treating of the day. He was so excited the entire time, going from door to door so fast. He finally stopped to take a break to enjoy his hard earned candy. 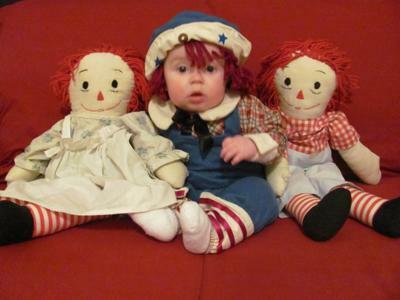 This ia Andrew dressed as raggedy Andy. 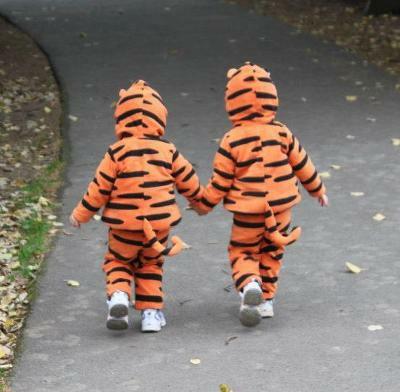 This is a beautiful picture of my twin girls, Catherine and Isabel (2 1/2 years) holding hands during a stroll at Boo at the Zoo, Magnetic Hill, Moncton NB, Canada. 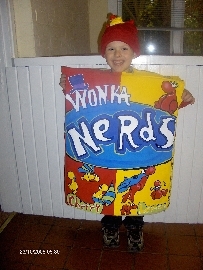 At the close of a Halloween Trick or Treat party, my son uknowingly added the perfect finishing touch to his costume. Kaitlyn is 10 years old and we live at the Jersey Shore and everywhere you go you can find these prize crane machines so we thought how great that would be to have her be as a crane machine with her being the main prize. My 6 year old is wearing her "Four Seasons" costume, which took me about 10 hours (total) to make. 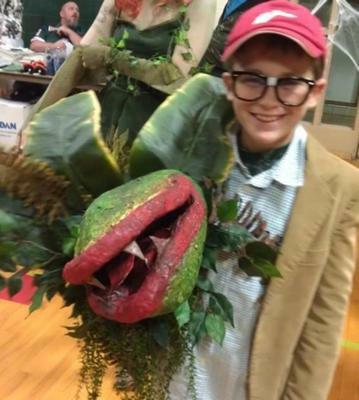 I also want to give praise to my courageous kid for going through with it; the costume hat is pretty heavy, and she graciously wore it for the whole halloween night without complaining and stopping 100's of times to let passers-by take pics of her! 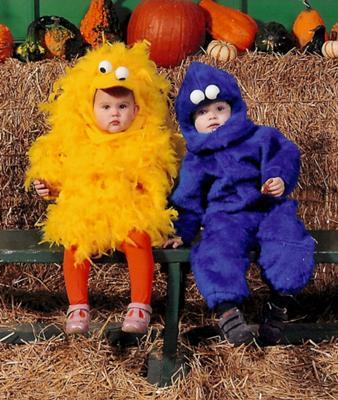 My almost 2 year old twins just love Sesame Street so it wasn't hard to decide what they should be this year for Halloween. Nathan loves to talk in the Cookie Monster voice and I knew Brooke would be an adorable Big Bird. It was my first time to make homemade costumes but I was lucky to have help from a friend who insisted I do all the sewing myself but walked me through step by step. 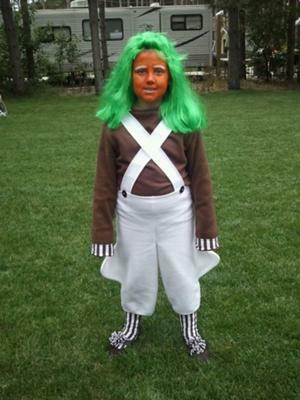 My 8 year old daughter has had the nickname Oompa Loompa since she was a baby, she begged this year to actually be one. Side View of the Side Loader! 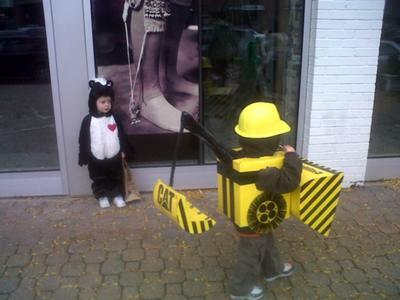 Owen's love for side loaders was not going to leave by Halloween. 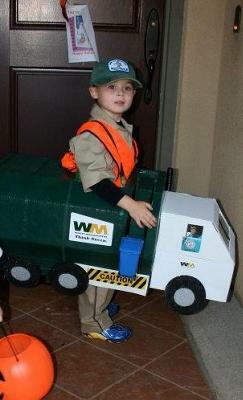 Without a side loader costume available for purchase, ANYWHERE - Mom and Dad set out to make one! Hard to tell in a single picture, the side loader has a working trash container to "dump" candy into the truck. There are 'caution' stickers and vanity plates that read 'Owen's Trash Truck'! 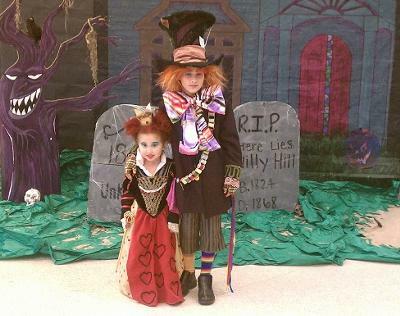 "CUTEST 'Halloween Kids!' 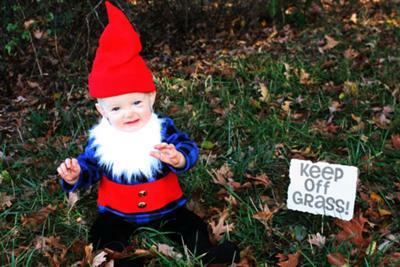 FUNNY, even of the BABY :-)!" 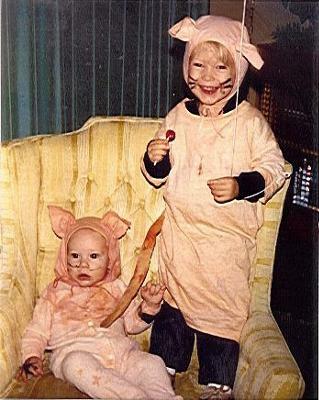 So-o cute 'Halloween Kids' costumes (which I made despite serious disability due to my catastrophic accident) for our LDS Church Halloween Party, in Bountiful UT at Grandma's house, taken 10/30/1982 and remains FUNNY! 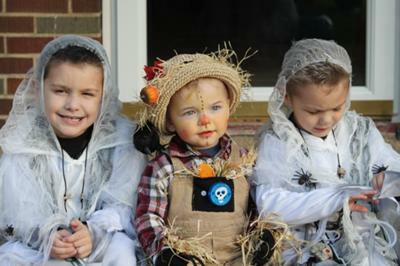 -sent in by Mom, Debbie Piepgrass, taken L-R: baby, Brian Piepgrass, David Piepgrass, 2 years. This is our great big happy family, we have all been friends for a long time now. We had a blast. No matter what we all consider eachother our brothers and sisters! 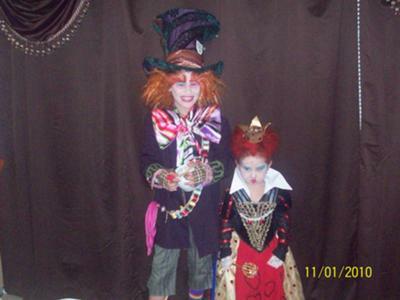 Gemma had croup so we only got a couple pictures of her in her costume but Isabelle and Lola had so much fun! 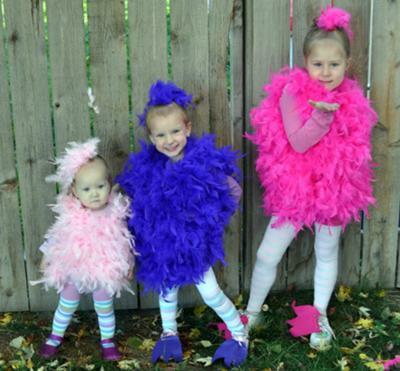 I made these with feather boas! 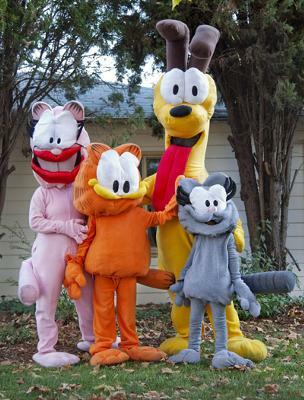 My 7 year old son, Adonis wanted to be Garfield for Halloween and he convinced his sister to be Nermal. 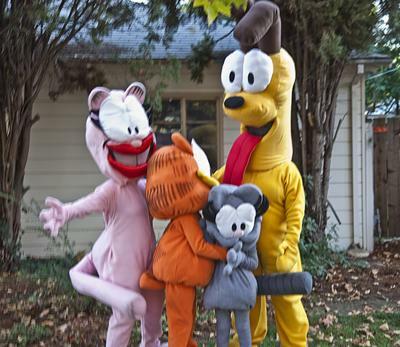 So, my partner and I decided to join in with Odie and Arlene. It was a blast! Since Adonis is autistic, Halloween has always been problematic. While he loves dress-up play with his sister and will gladly be a superhero, airline pilot or monster at home, he has always panicked when he needed to go out. But, he loved being Garfield. When we went out to a local mall to trick or treat we were asked to stand for photos many times. He did it graciously, even though he was overheated. He even acknowledged people who called to him with a wave! 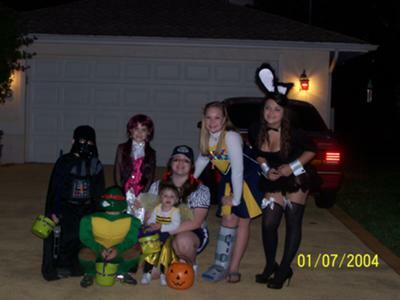 It was our best Halloween ever! 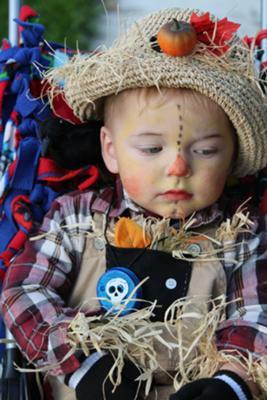 He was even calm about not winning the costume contest. 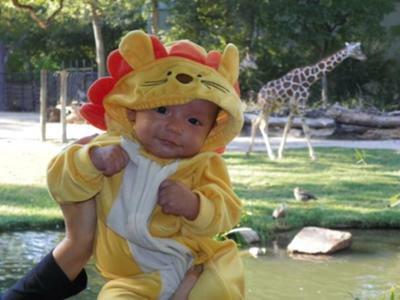 My little boy was not a fan of his costume, no matter how cute his mom thought he looked! My son PJ (Peter) is wearing a homemade wrecking ball costume. 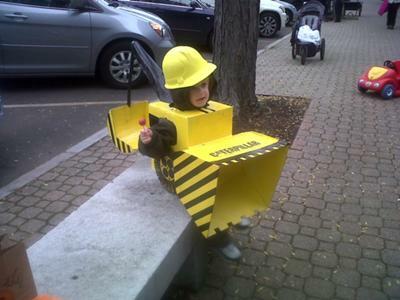 He had asked to be a tractor & with a little tweaking we came up with this instead. It was made using cardboard boxes, hot glue, paint, a styrofoam ball & printed accents. It was lightweight and easy for him to hold up, espescially with the handles added to the front. 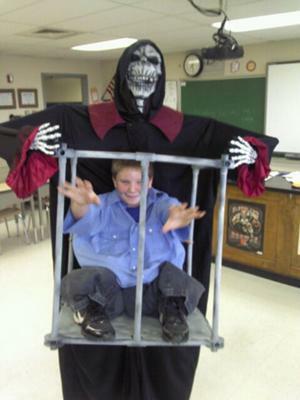 He had as much fun wearing the costume as it was helping me make it! 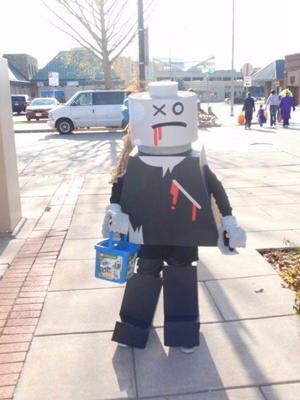 5 1/2 year old Alexander saw this costume in a book and decided that this was IT. 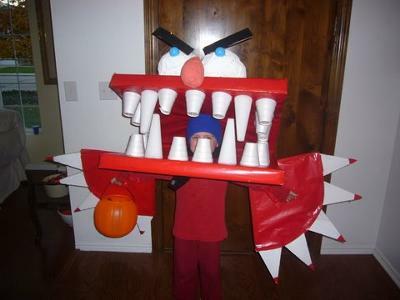 We worked together to create the best costume ever! I pick out our Halloween costumes every year and this year I found Olive Oyl and a Sailor Girl for $5.00 each, so I thought it would be perfect. 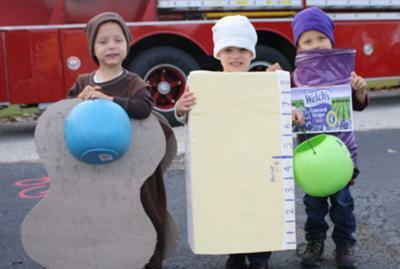 The costumes were practical for school, work, church, and trick or treating. 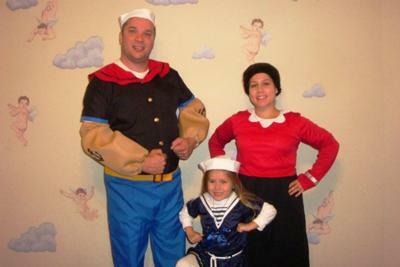 My husband is Popeye the Sailor Man, I am Olive Oyl, and our four year old daughter is a Sailor Girl.